Nestled in the midst of a spectacular box canyon in the San Juan Mountains, Telluride’s historic downtown is a picture-perfect hub for boutique shopping, gourmet cuisine and lively bars. 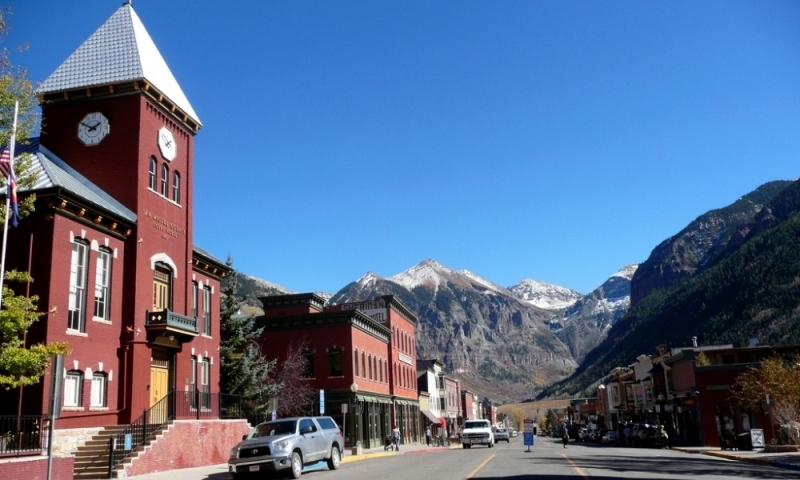 Take a historic walking tour of Telluride's most historic structures. Commentary provided by local Historian, Mr. Ashley Boling. Nestled in the midst of a spectacular box canyon in the San Juan Mountains. Telluride’s historic downtown is a picture-perfect hub for boutique shopping, gourmet cuisine and lively bars. Telluride’s Victorian-era architecture and eclectic local crowd add color and flavor to downtown’s picturesque setting. The history is rich too – Butch Cassidy robbed his first bank here. Telluride’s downtown is pretty hard to miss as it’s the road you drive into town on. For those directionally challenged, look for Colorado Avenue or follow the crowds or lights at night. Telluride has busy summer and winter seasons. The first snows of September start to bring people back into town, but the heavy tourist season coincides with the ski resort’s opening and closing, usually from Thanksgiving weekend to the first week of April. Summer really kicks off with the Telluride Bluegrass Festival in the middle of June and lasts until late September. Between these seasons many businesses close and the town slows to a crawl, though there is still plenty of stuff to do and see. Check out the wild flowers and leaves changing color in October and you won’t regret it. Telluride’s downtown is the place to see and be seen, which here can be a new pup or trendy fashion. Take a walk down Colorado Avenue and check out the boutique shopping and buzzing art galleries. The Telluride Historical Museum is definitely worth a trip. The historical photos of the areas rich mining history put the scale of the operations in perspective. It’s located one block off Colorado on Gregory Ave.
Make sure to take a peek at the free box on the corner of Colorado and Pine, a designated sidewalk space where goods can freely be taken and dropped off. With Telluride’s long-lineage of philanthropy, you never really know what you may find. Or be like the locals and order a $2 Pabst Blue Ribbon at nearly any bar, find a good place to sit and slowly soak in the beauty.